Author Michael Lewis has provided rich source material for Hollywood’s heavy hitters in recent years. 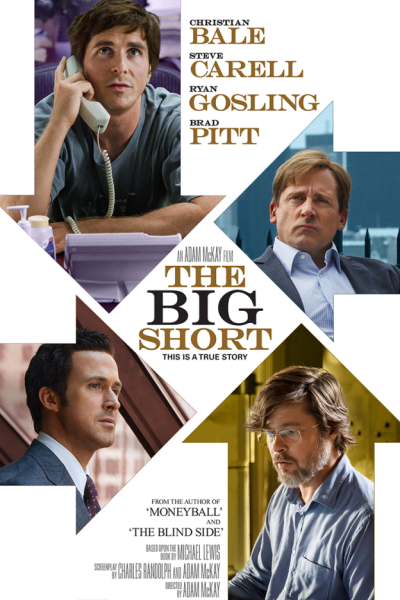 The Big Short follows The Blind Side and Moneyball as top notch adaptations executed well by a cast of A-listers. I’ve been anticipating this film since first seeing the trailer a couple months back but had two main questions: How would the director handle such a complex and dire issue, and wasn’t it odd that the director was Adam McKay of Ant-Man and Will Ferrell movies fame? The Big Short tells the story of a small group of savvy risk takers who found the angle in America’s housing bubble. Steve Carell has received the most vocal critical buzz for his performance as crusading hedge fund manager Mark Baum, but Christian Bale’s portrayal of Dr. Michael Burry is equally remarkable. Burry is the one who first discovered just how unstable America’s housing market was based on low return subprime loans. The film spends plenty of time with Burry as he awaits a big payday in 2007 once unreasonable variable rates kick in and large scale credit defaults and foreclosures begin. Ryan Gosling is fine as Jarrett Vennett, a trader who hears about Dr. Burry’s credit default swap plan. When a misdirected phone call from Vennett’s office loops in Mark Baum’s team, the frosty alliance is formed. Vennett is also our narrator throughout the movie, repeatedly breaking the fourth wall to chat with us. The technique is effective and makes us feel as if we’re also in on the secrets of these wily traders. You might argue that we’re all in this together, accessories even. But McKay goes further than direct narration in what proves to be the film’s smartest story-telling device. Complicated concepts are explained through terrific, if unexpected cameos by Margot Robbie, Anthony Bourdain, and Selena Gomez. For example, Robbie educates us on subprime mortgages while sipping champagne in a bubble bath, and Bourdain uses fish stew in his kitchen to break down how collateralized debt obligations work. The only time I’ve seen anything comparable is in Annie Hall when Woody Allen hops out of the movie theater line to produce Marshall Mcluhan from the lobby in order to slam a pretentious professor. Who knew cinematic economics could be so fun? A pair of young investors named Charlie Geller (John Magaro) and Jamie Shipley (Finn Wittrock) also get wind of the small group who are shorting (betting against) the housing market. They find a mentor in retired banker Ben Rickert, played by Brad Pitt, who appears to reprise his role from Ocean’s Eleven when he pretended to be a doctor in order to steal all that casino’s money. But larger questions about the integrity of the entire system are raised when power brokers on Wall Street somehow hide what our savvy insiders know to be true. The final third of the film moves beyond reckless business practices to focus on the outright corruption guaranteed to threaten the global economy. These characters fit right into our world of conflicted anti-heroes. The movie frames them as sympathetic, and the horror they feel seems genuine, yet they still profit greatly off the collapse of the economy. Ultimately, though, the collapse of the system and pervasive fraud were inevitabilities they could not have stopped. One theme that emerges throughout this movie is awareness. We move from Dr. Burry’s keen insights to the main players' continuing realization of just how far the rabbit trail went and how corrupt the system was. Most painfully, however, this story is about the lack of awareness the rest of the country had while either signing documents that would spell default and doom by 2007 or simply relying on stability and return from a sick system. As edutainment goes, The Big Short is about as impressive a blend of pop culture and academia as I’ve ever seen. But the movie is unnerving. It’s essentially a horror-comedy without zombies or slashing knives. I would say it’s a tale of greed gone wrong, but really the outcomes were inevitable, and McKay and company have done a great job of showing us how it all went down.